Illustrated with delightful period line drawings and color photos, Betty Crocker's Outdoor Cook Book is a charming look back at outdoor dining in the 1960s. This hidden-spiral reprint features 200 tried-and-true recipes for barbecues, picnics, camping trips, and boating excursionsincluding Beef Tenderloin Roast, Grilled Lobster Tails, and French Fried Onion Ringsplus expert tips on barbecue equipment and techniques. There are even illustrated instructions for an authentic Down-East clambake. 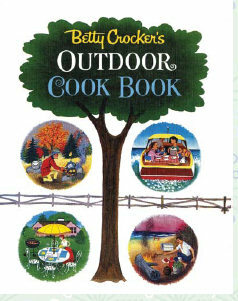 Following in the bestselling footsteps of previous Betty Crocker Facsimile Editions, this nostalgic guide to outdoor cooking and entertaining is sure to be a hit.